Unfortunately the last time I checked this hotel had closed. 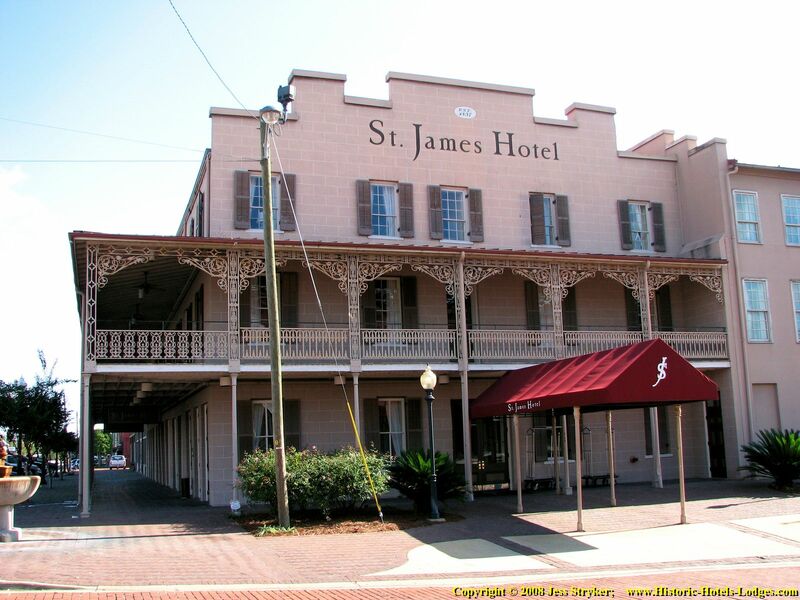 There are proposals to remodel and reopen the St James (possibly with a new name), so check local hotel listings if you plan to visit the Selma area. These photos were taken October 25-26, 2007 unless noted otherwise. Built in 1837, the hotel was originally named the Brantley Hotel after Brigadier General John Brantley, who headed the stock consortium that financed the construction. 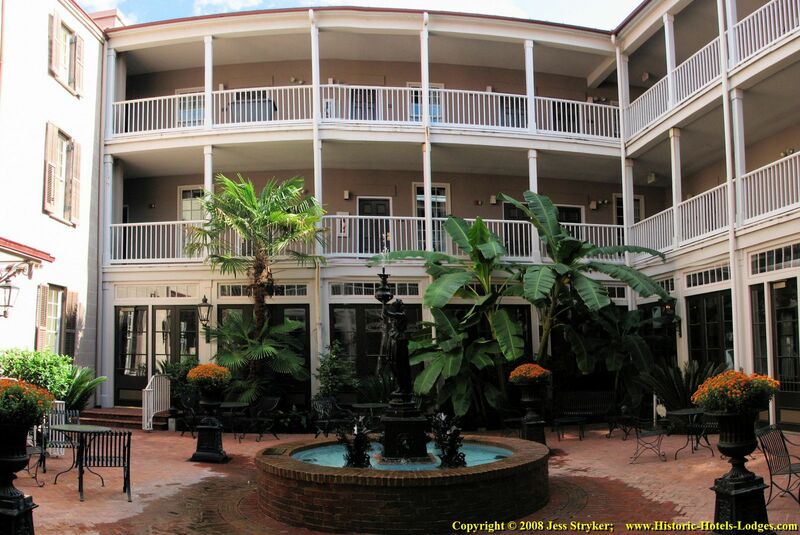 The hotel was built adjacent to the docks on the Alabama River in the City of Selma, Alabama. It provided lodging and meals for the merchants who traded in cotton and other commodities. It appears to have had many owners over the years. At some point prior to the Civil War the hotel was renamed the Troupe House. 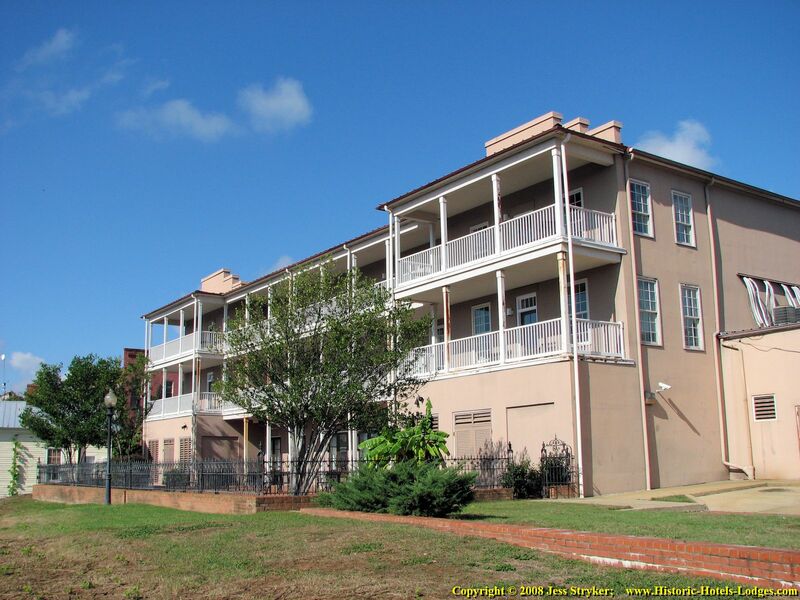 During the years leading up to the Civil War the hotel was owned by Dr. James Gee. Gee had inherited a slave by the name of Benjamin Sterling Turner from his brother. Mr. Turner was educated and had shown a talent for management, so Gee made him manager of the hotel. Benjamin S. Turner went on to become the mayor of Selma, and was the first African-American to serve in the U.S. Congress. When the Civil War broke out in 1861 Selma became a major manufacturing and distribution center for the Confederacy. 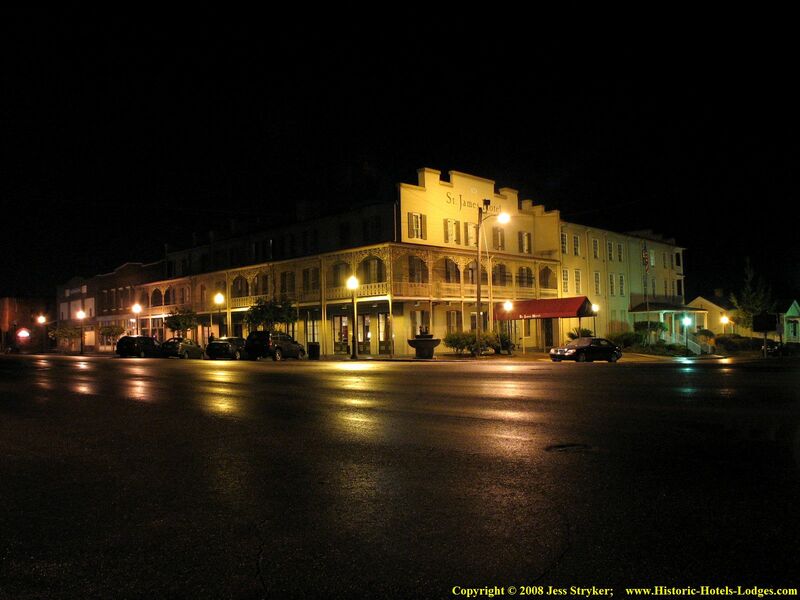 In 1865 the City of Selma fell, and the hotel was taken over by the invading Union troops. The troops made the hotel their headquarters, thus sparing it. In a standard practice of the war, they torched much of the rest of the town. After the war the city of Selma rebuilt and prospered. In 1871 Captain Tom Smith bought the hotel and changed the name of it to the Saint James Hotel. The hotel did well during this period. In 1885 a bridge across the Alabama River was constructed just south of the hotel. While the original bridge is long gone, the bridge keeper's cottage still stands adjacent to the hotel. 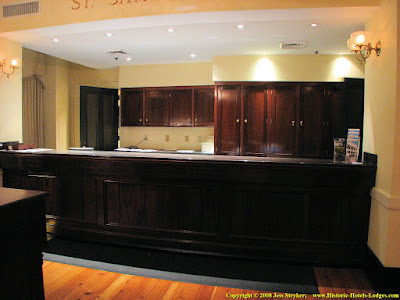 Over the years the hotel changed hands several more times, and the St. James slowly became well known for its dining room and drinking room, which were popular with locals. The guest rooms were less popular, as newer and nicer hotels were being built in the area. 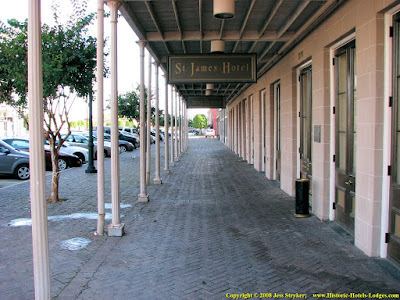 The St. James eventually became a residence hotel, while slowly deteriorating more and more. 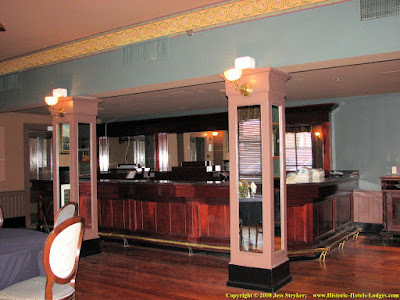 During this declining period the hotel's claim to fame is it's connection to the outlaws Jesse and Frank James, who are said to have been guests in the hotel in the 1880's. A portrait of a lady said to have been Jesse James mistress at the time now hangs in the hotel sitting room. By the 1890's the St James was showing signs of it's almost 50 year age, and it closed it's doors in 1892 or 1893. After it's demise as a hotel the building saw a number of commercial and industrial uses. Old guest rooms became offices or were used for storage. The ground floor was gutted and turned into a feed store and later a tire recapping factory. The rear wings of the hotel were torn down and the courtyard removed to make way for storage. The original exterior walls and balconies remained and the upper floors of the main building were only minimally changed over the next 100 years. 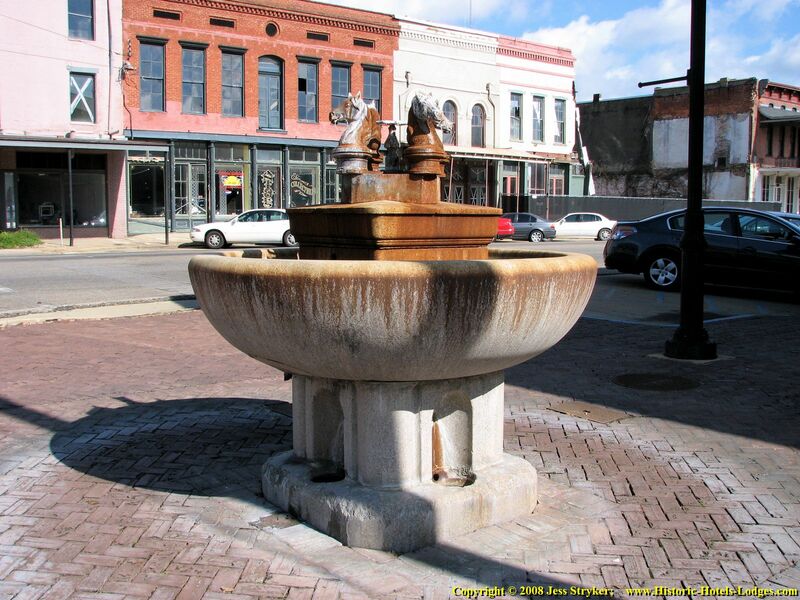 The property was eventually purchased by the city of Selma for the purpose of preserving the historical building. Money for restoration was raised from various sources including federal grants and private donations. 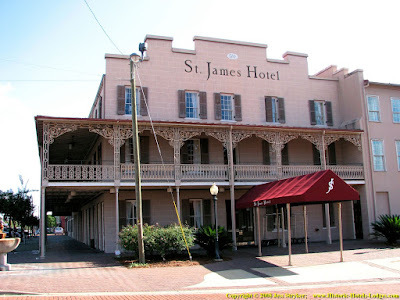 The Saint James Hotel has now been restored to look typical of a hotel in the early 1800's, although not a duplicate of the original hotel. New rear wings were built to replace the ones that were removed, the courtyard was restored and replanted, and modern amenities were installed such as an elevator, heating and air-conditioning, and somewhat larger rooms than the originals. Essentially this is a new hotel built within the shell of the old one, while keeping it as historically accurate as possible. The resulting new St James Hotel is a masterpiece of architectural restoration work. It is furnished with antiques in the public areas and reproductions in most of the guest rooms. 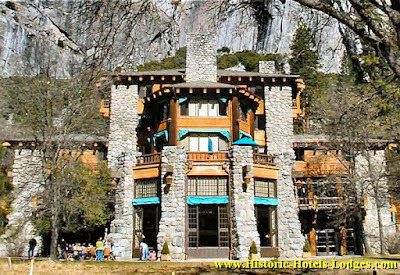 This hotel is definitely worth driving out of the way to visit! 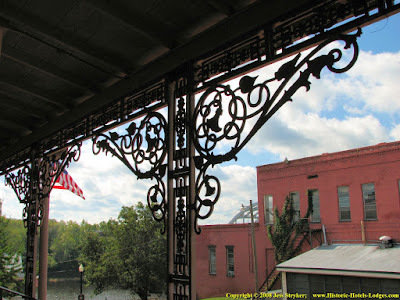 Built in 1837, the St. James Hotel sits on the banks of the Alabama River. At the time it was built there was a dock adjacent to the hotel where river boats loaded and unloaded cargo. This created the need for a hotel to provide lodging for visiting businessmen. The hotel was completely rebuilt in 1997 through the efforts of a public/private partnership. The part of the hotel along the streets with the balconies is the original historic section, the ornate balcony castings are original, as are the doors and windows. New side and rear wings were built in 1997. The original wings were demolished during the period when the former hotel building was used as a factory/warehouse. The Saint James viewed from the corner of Water Avenue and Washington Street. The section of the hotel that you see here is the original historic section of the hotel. 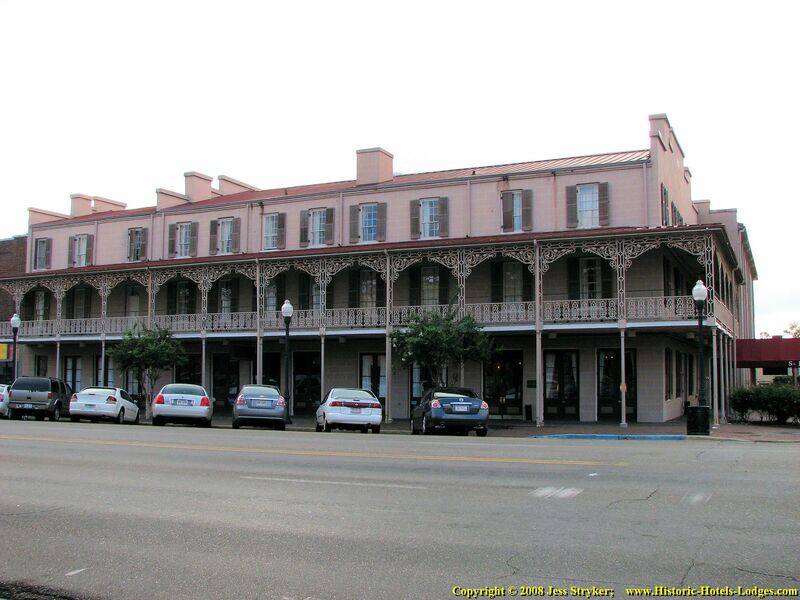 With the exception of the autos and paved street, this is very much how the hotel looked when it was built in 1837. If you look closely you will notice some of the 3rd floor window shutters are missing and others are crooked. They were damaged by Hurricane Katrina. At the time these photos were taken a major remodel and repair of the hotel was underway. This is the front porch of the Saint James Hotel, on the Water Avenue side. 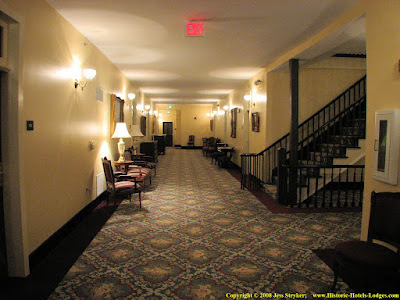 The doors closest to the camera lead into the lobby, farther down the porch is the entrance to the drinking room. Why so many doors? In the days before air-conditioning the doors were opened to allow the breeze to cool the rooms. Doors allowed more air flow than a smaller window would. Over the years the hotel has had a number of names. The hotel was originally named the Brantley Hotel, the name was later changed to the Troupe House. In 1871 the hotel was renamed the Saint James Hotel. 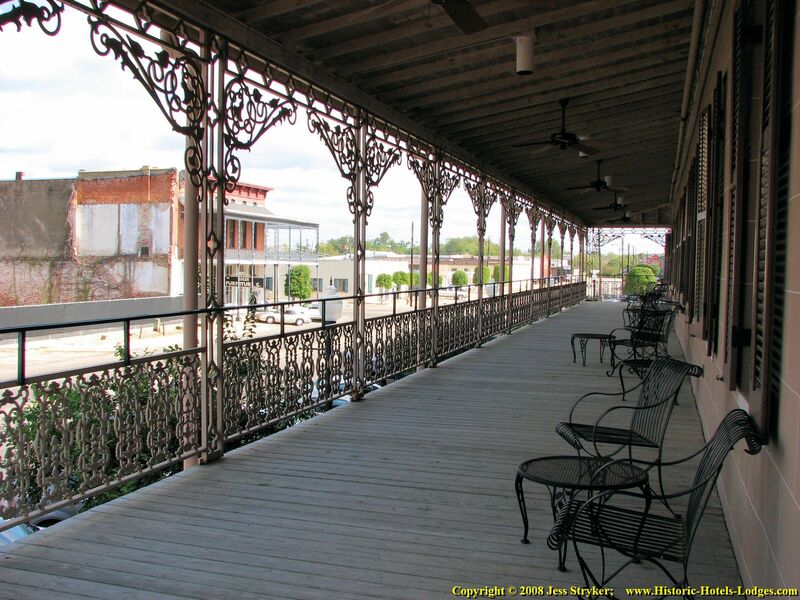 This is the 2nd floor balcony on the Water Avenue side. This is part of the historic section of the hotel and the iron grillwork on the balcony is original. This photo is taken more or less directly above the location of the previous photo. Here's a closer look at the intricate original ironwork on the balconies, which dates from 1837. The New Orleans style French grill-work was very popular at the time the hotel was built. The photo above was taken on the 2nd floor balcony on the Washington Street side, looking toward the river behind the hotel. It was lightly raining the evening we arrived at the Saint James, allowing for this photo of the lamps reflecting on the wet streets. On the right side in this photo you can see the new rear wing of the hotel. The original rear wing of the hotel was torn down sometime after it closed in 1893. When the hotel was restored in 1997 this new rear wing was added. Most of the current guest rooms are in this rear wing. The rear of the Saint James Hotel. As previously noted, this rear wing of the hotel is not original, however the architect tried to make it look as much as possible like the original rear wing. On the bottom floor of this wing is the ballroom and a meeting room, the upper 2 floors are guest rooms. If you look at the very right of this photo you can see the rear of the adjacent building, which is where the support services (kitchen, storage, physical plant) for the hotel are located. 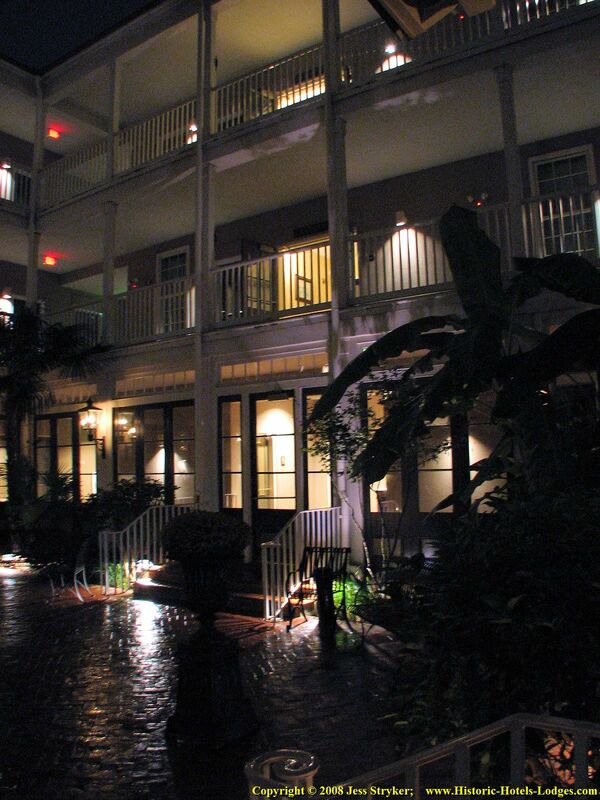 The Saint James has a beautiful interior courtyard, called Cotton Court, with tropical plants and gas lamps. This photo was taken facing the new rear wing of the hotel. The fountain is not original. The curvature of the roof and balconies is lens distortion in the photo. This is Cotton Court at night, lit by the flickering gas lamps. 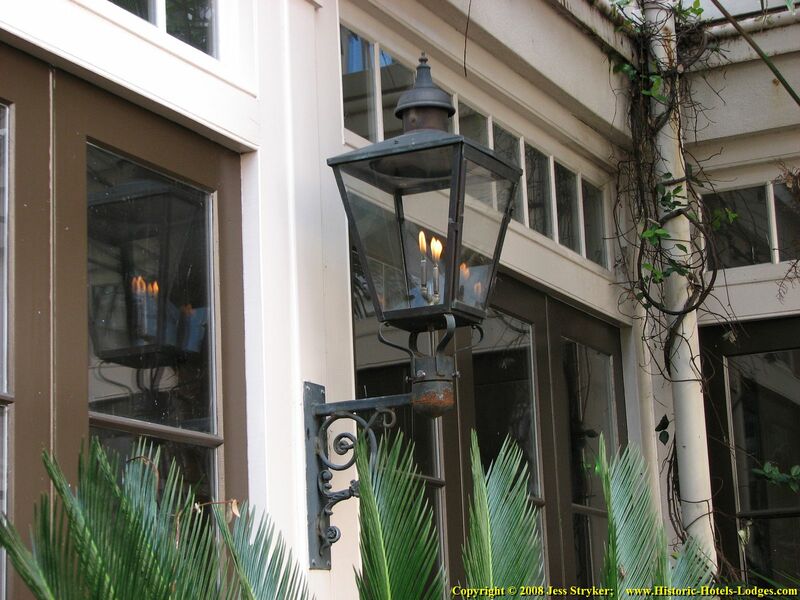 A closer look at one of the gas lamps in the courtyard. 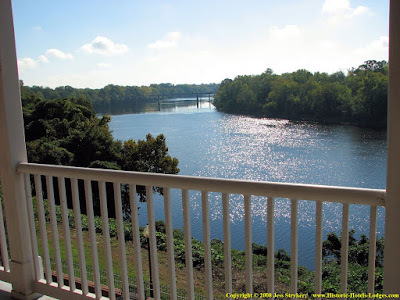 The view of the Alabama River and the railroad bridge looking to the east from the rear balcony of the Saint James Hotel. The river front rooms in the rear wing have doors that open to a common balcony with this beautiful view. This historic fountain has been installed at the corner of Water Avenue and Washington Street at the front corner of the hotel. It was relocated here from elsewhere in town. Now let's take a look inside the hotel. This is the front desk of the hotel. The first floor was gutted when the hotel was used as a feed store. Everything now on the first floor was reconstructed in 1997 to mimic the look of an 1800's hotel.. 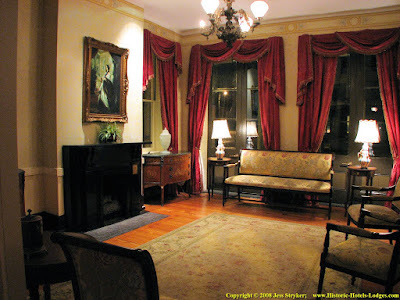 This is the sitting room, it is located at the corner of the historic section. The doors with draperies open onto the Water Avenue side. In the days before air conditioning the doors would be opened to allow air movement through the room. The cast iron fireplace is original. 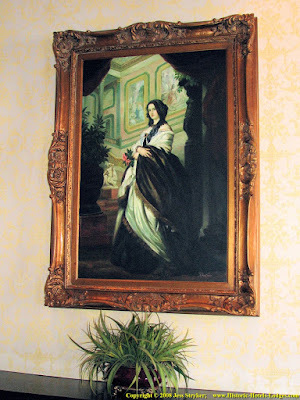 The painting of the woman over the fireplace is of Lucinda, it is believed she was a long time resident of the hotel. A closer look at the painting of Lucinda, who is said to have been the mistress of the famous outlaw, Jesse James. The legend is that Jesse James and his brother, Frank, were guests at the hotel in 1881. 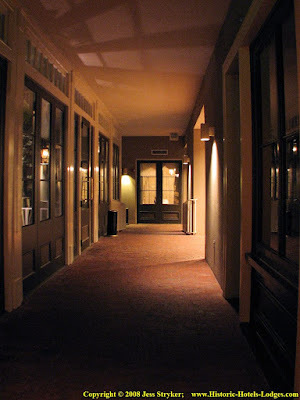 It is claimed that the ghosts of both Jesse James and Lucinda haunt the hotel. Lucinda has been seen in one of the rooms in the historic section and also in the hallways throughout the hotel. Guests and staff also report seeing and hearing a male spirit, thought to be Jesse James. He is seen sitting at a table in the drinking room or exiting rooms. He is reported to wear spurs which make noise when he walks. A third spirit of a barking dog has also been reported. Barking has been heard by the staff on numerous occasions, but no dog has been seen. 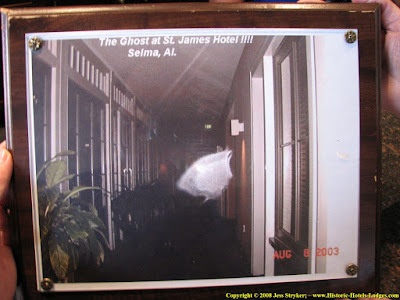 The hotel has this photo of one of the hotel's resident ghosts. Ask at the front desk if you want to see this photo, they don't have it on public display, but will show it to you if you ask. If you like to believe in ghost stories don't read the spoiler in the next paragraph! While this is not the best example of a ghost image, it is a good example of the difficulties presented when trying to take a flash photo in an area surrounded by glass windows! If you are familiar with photos you will quickly realize that the white blotch on this one is the reflection of the camera's flash from the windows back onto the curved surface of the camera's lens. There are windows on both sides of the hall, as well as at the end of the hall. The next photo is one I took at the same location without using a flash. This is the rear hallway on the ground floor. To the left in the photo are the meeting rooms. This photo was taken at the same location as the previous "ghost photo". No ghost showed up for my photo. Boo. This is the drinking room (bar) at the hotel. It is on the front side of the historic section with doors opening onto Water Avenue. It is a reproduction of a bar typical of the 1800's period. The original bar was torn out when the hotel was used as a tire recapping plant. This is the elegant dining room. The dining room is on the first floor in the rear of the historic section. The doors and windows on the right in the photo open out onto the center courtyard. This dining room is not original. 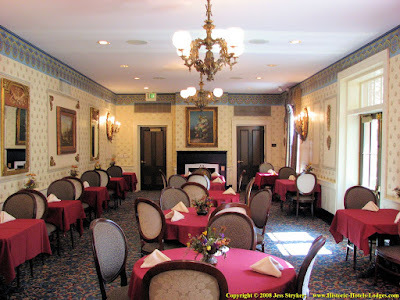 It is known that the original dining room was on the second floor, since the 2nd floor of the historic front section still has original rooms it is most likely the original dining room was in one of the rear wings of the hotel that was torn down. A 2nd floor location in the rear wing would allow for a river view, which makes sense. 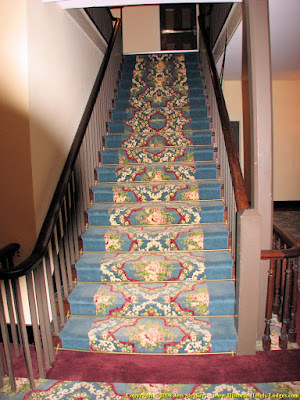 Unlike the first floor, the second and third floors of the historic section of the hotel were essentially intact when renovations began in the late 1990's. These stairs to the 3rd floor have the original railings. 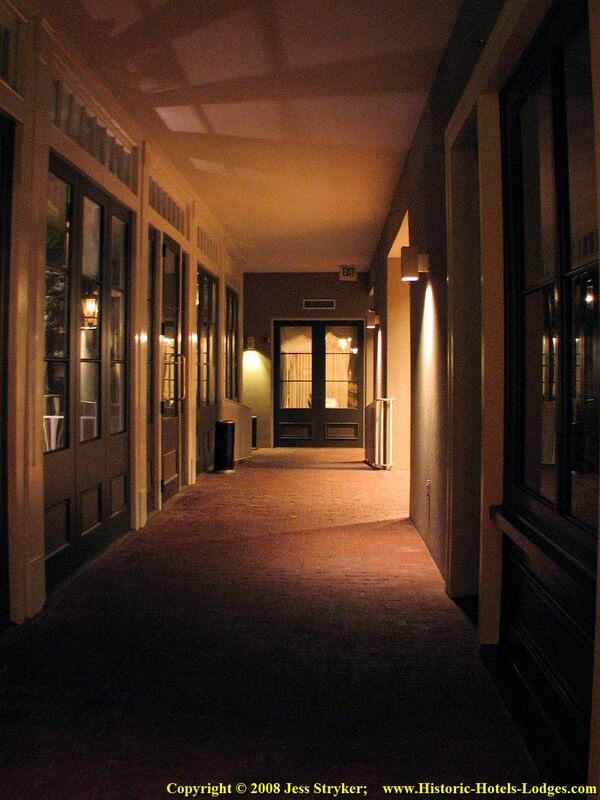 This is the second floor hallway in the historic section of the hotel. The stair railings are original. This is a typical guest room (#317) in the new rear wing, the door at the rear of the room opens out onto the balcony. Windows are double-pain glass reproductions in the same style of the windows in the historic section. This is a guest room in the historic section of the hotel. The fireplace mantle is original, however the fireplace is no longer functional. This is the bath in one of the rooms in the historic section. Originally the rooms did not have private baths, so some modifications to the room layouts was needed to fit in new baths. 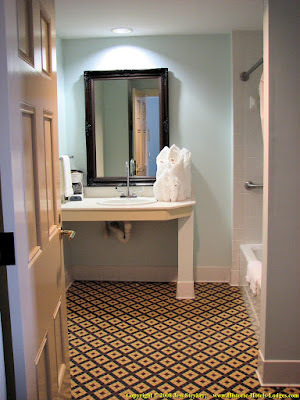 It is likely that the architect combined two or even three of the original rooms to create enough room for a new larger room with a private bath. The rooms in these old hotels were typically just large enough for a small bed and maybe a chair. Another guest room in the historic section of the hotel. The chairs are moved around because maintenance crews were working on the room when I took the photo. Photos and text by Jess Stryker.